Snakegrass is now available on Ravelry! 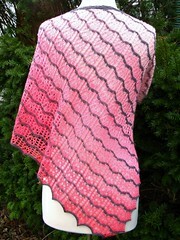 Much thanks to Outlaw Yarn for providing the soft and scrumptious Bohemia Sport that I used in this design. When I was little, my dad took me on hikes on his parents’ farm in Minnesota. We rambled through woodsy bits, up the hill, across the rockslide, and through tall grassy meadows. I remember him handing me stalks of snakegrass (aka horsetail, aka puzzlegrass, aka Equisetum) and showing me how the segments can be taken apart and put back together. This design reminds me of the stacked branching structure of snakegrass. One edge is serrated; the other edge undulates smoothly. Each tier grows organically from the previous tier. Snakegrass is worked flat. The pattern is achieved by alternating colors and slipped stitches. 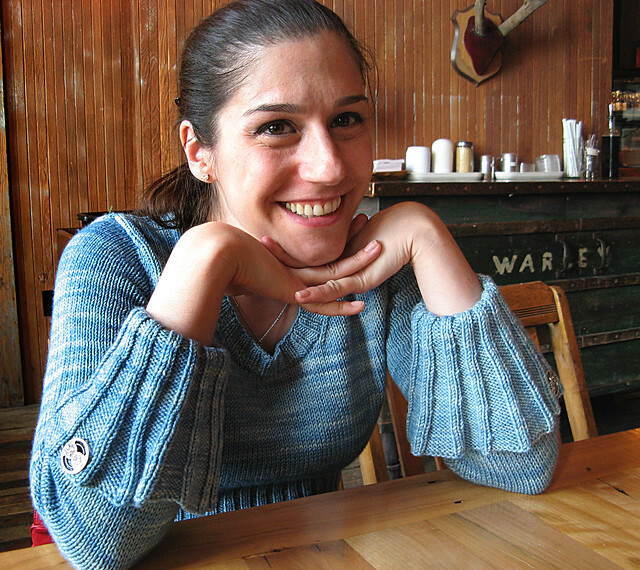 The finished item may be worn as a scarf, or grafted to form a long cowl. The 60-row pattern is charted; full written directions are also provided. 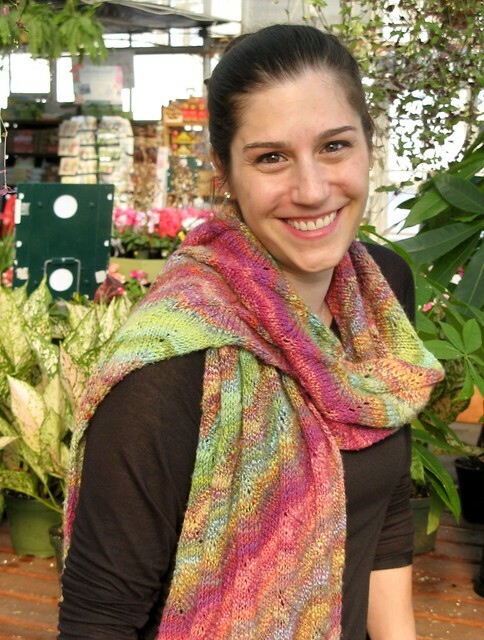 Silvan Vinyard is an asymmetrical garter-stitch shawl with a leafy edge. Designed for the Random Fandom Yarn Club, it is inspired by the woodland elves of Tolkien’s novels. Imagine a silvan vinyard tended by elves. Would they wear the grapevines draped sweetly ‘round their necks? I think they might. 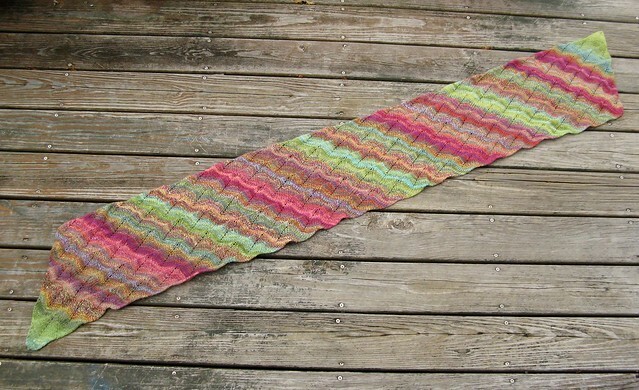 Silvan Vinyard is easily adapted to any weight yarn: simply use an appropriately-sized needle. It is easily enlarged if you have more yardage: simply work additional repeats of the body pattern. This pattern is mainly charted. Full written instructions are provided for all charts. I designed Eponymous Mitts to show off vibrant colorways in a quick, fun-to-knit pattern. 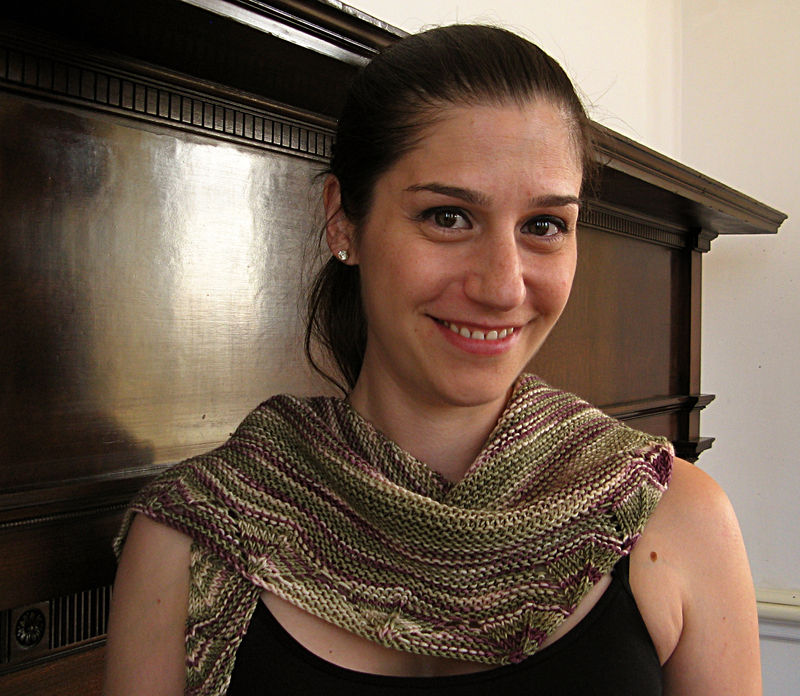 This pattern features a new worsted-weight yarn from A Hundred Ravens: Epona. It is similar in structure to Aesir, and it has the same bouncy feel and takes dye beautifully. For a limited time only I am collaborating with A Hundred Ravens to promote this awesome new yarn. If you try out Epona, I’ll give you the pattern for Eponymous Mitts for free (details in the AHR forum). The mitts are knit flat, then seamed with a thumb-hole — super easy. 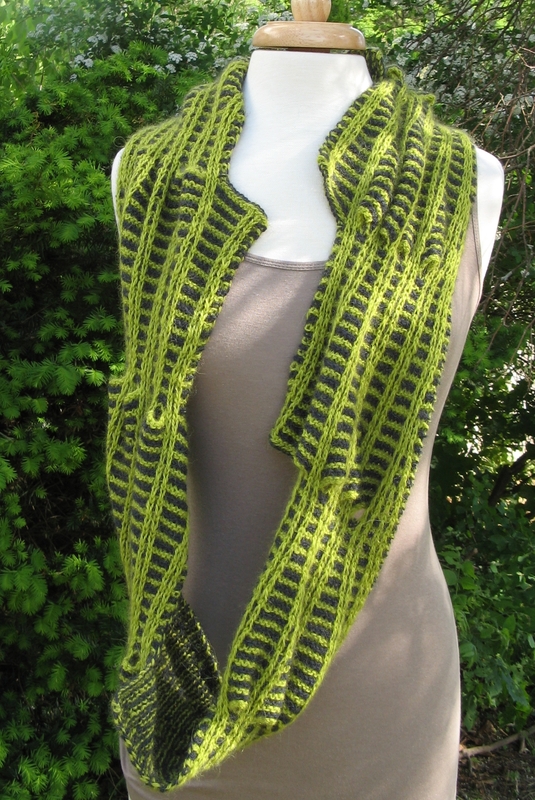 The slip-stitch pattern highlights variegated yarn. Pattern is sized for children’s small through men’s large; length is easily adapted if you prefer longer mitts. I’m pleased to bring you Crosswind! Crosswind is a cropped sweater that features dramatic flared cuffs, a scoop neck, and deep ribbing at the waist. The cuffs fold back over ¾-length sleeves and are sewn in place: use your favorite buttons for a decorative accent. Crosswind borrows its silhouette from the sweaters of the 50’s, with steampunk details to delight and inspire. Worn with 1-2” of positive ease, this garment is both forgiving and flattering. 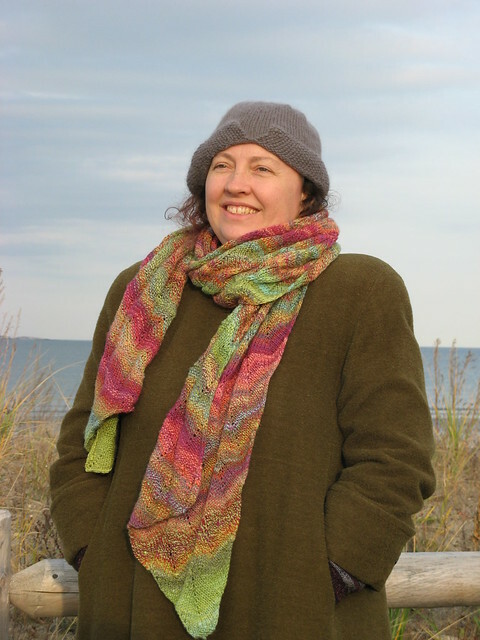 Body and sleeves are worked bottom-up, in the round, until armhole bind-offs. The ribbed neckline is worked in the round from picked-up stitches. Traditional sleeve caps provide a tailored fit. Pattern includes directions for plain ribbed cuffs. I’m especially excited to launch this design, because Knitcrate is offering a limited-edition Crosswind kit. The kit includes the pattern, yarn, and some awesome extras. 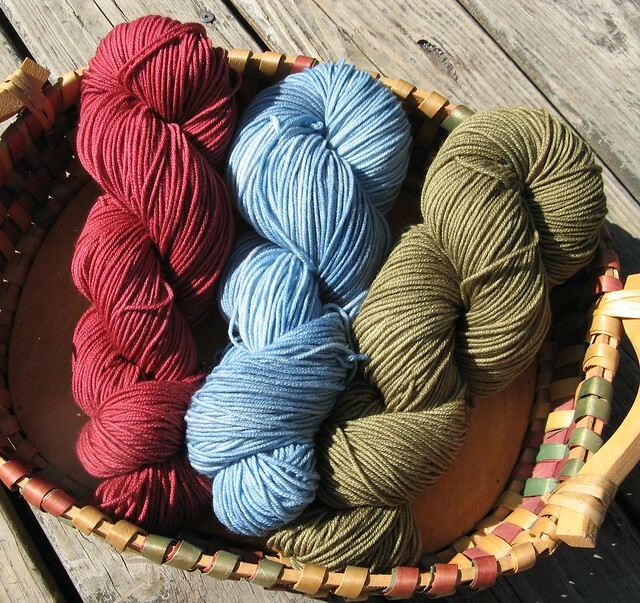 You have a choice of three exclusive colorways of Aesir from A Hundred Ravens. Aesir is a round and bouncy 8-ply superwash merino that straddles the line between sport and DK. 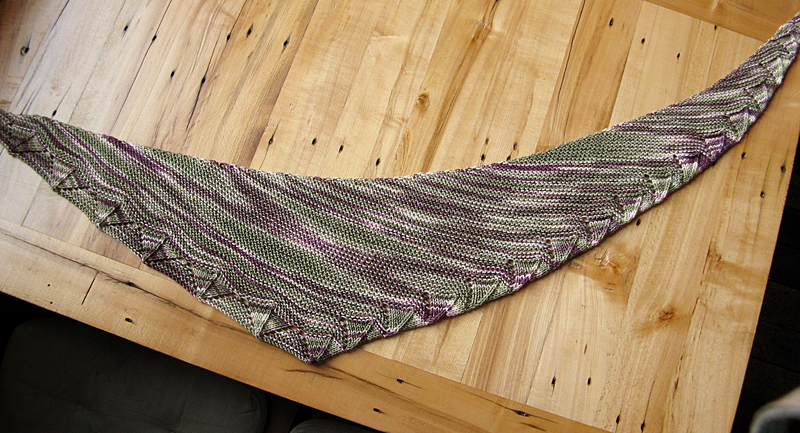 It has the perfect combination of substance and drape when worked at a DK gauge (5.5 spi). The 8 plies are actually four 2-ply strands, cabled back on themselves; this lends Aesir durability and strength, making it a near-perfect sweater yarn. This is a design that I’ve adored pretty much from the first sketch all the way through blocking and photography. This isn’t normally the case for me! I’m used to a certain stage of my design process where I kinda sorta hate what’s on the needles. 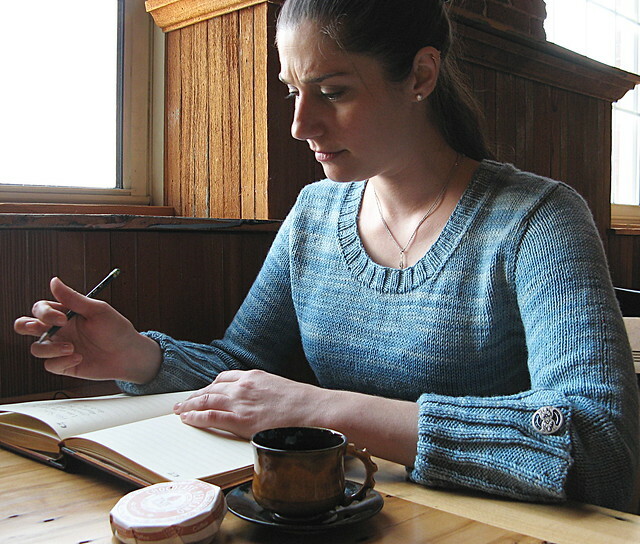 But Crosswind practically knit itself … I love the cuffs, love the deep ribbing, love the pretty scoop neck. It’s been a busy, busy spring in my head design-wise — and my hands have been busy too! I haven’t knit many just-for-me projects in what seems like ages…. In fact I have so much going on, I had to break down and make a spreadsheet of all the design projects I have planned, submitted, on the needles, in need of photography, and off to the Tech Editor. I have a couple designs coming out Very Soon that I’d like to share with you, dear reader. These are sneak peeks — full posts on each design will be forthcoming. If you are in the Random Fandom yarn club, beware! Spoilers below (specifically, #3). A Hundred Ravens is debuting their new worsted-weight yarn Very Soon Now. 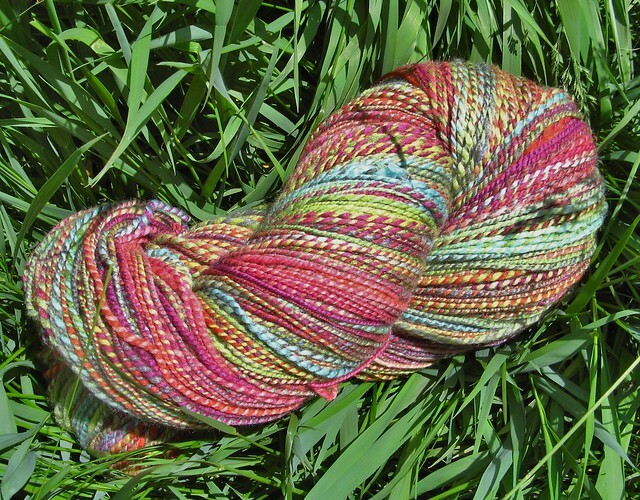 The yarn is called Epona (after the Celtic goddess of horses), and it is simply delightful. 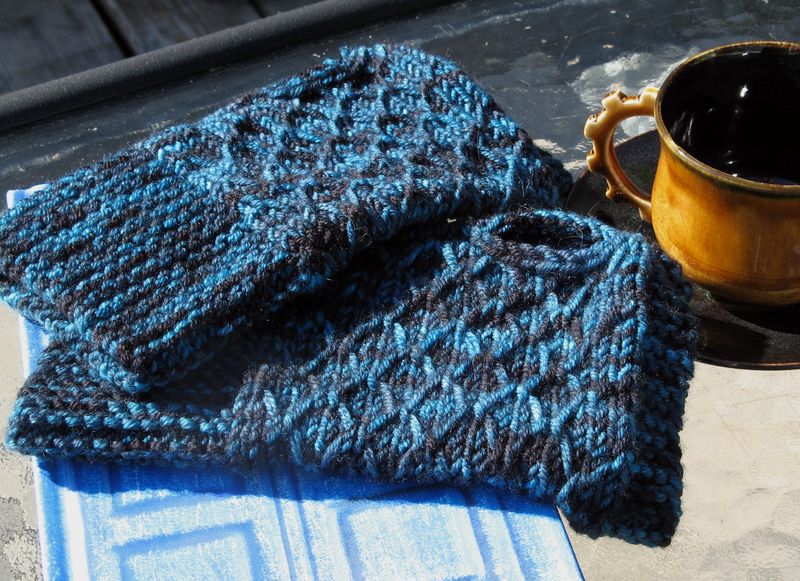 I designed these mitts as a quick one-skein project — great for gifts, great for you :). Seriously, I love this sweater so much. Those cuffs! Swoon. This is my first garment design in Aesir, and I’m pleased to say I was 100% correct in thinking that it is awesome for sweaters. Also, I am Very Excited because KnitCrate will be selling this design as a kit! The KnitCrate kit comes with the pattern and the yarn you need to complete your very own Crosswind. Kate and I made three brand-new gorgeous colors for the kits — can’t wait to share them with you. 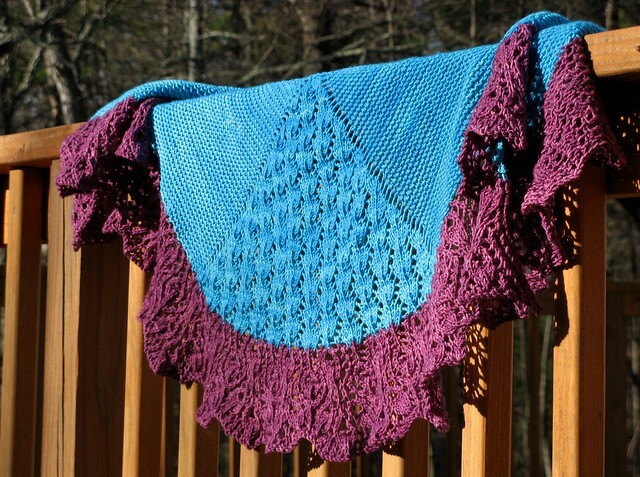 This is design features the June yarn-of-the-month for Random Fandom. Club members … look away if you don’t want to be spoiled! 🙂 The shawlette is mostly garter, with a leafy edge that makes the colors sing. This is those any-yarn, any-amount-of-yarn designs — just use the right needles, and keep knitting until you run out of yarn. Done! Just in time for Stitches South …. 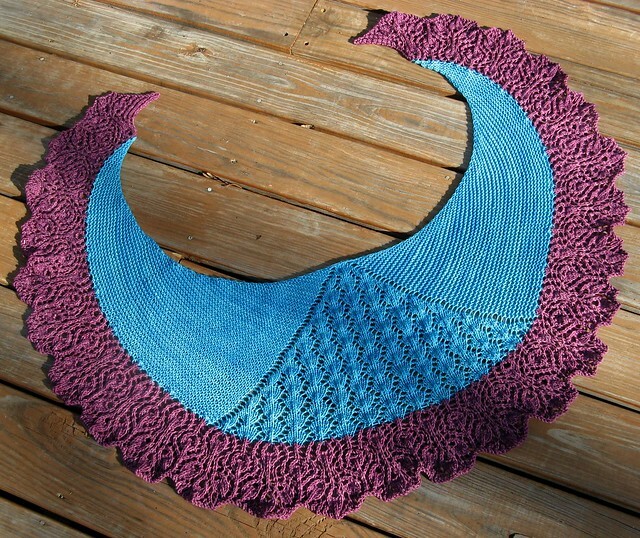 Designed for two contrasting colorways, Altitude is a crescent-shaped shawl with an extravagant lace border. 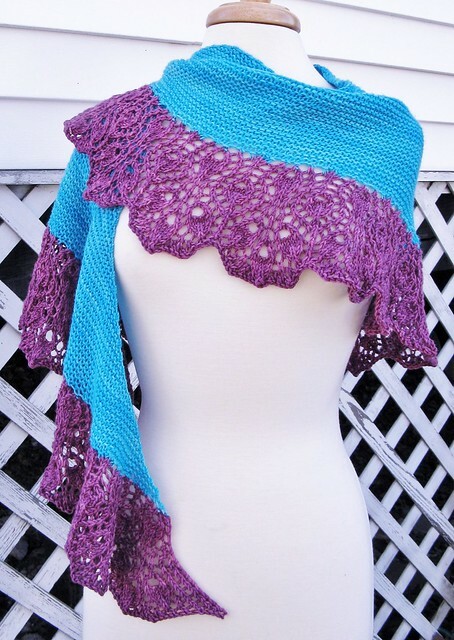 The shawl begins at the back neck with just three stitches. The body features a simple lace pattern flanked by garter-stitch wings, and is suitable for both tonal and moderately variegated colorways. 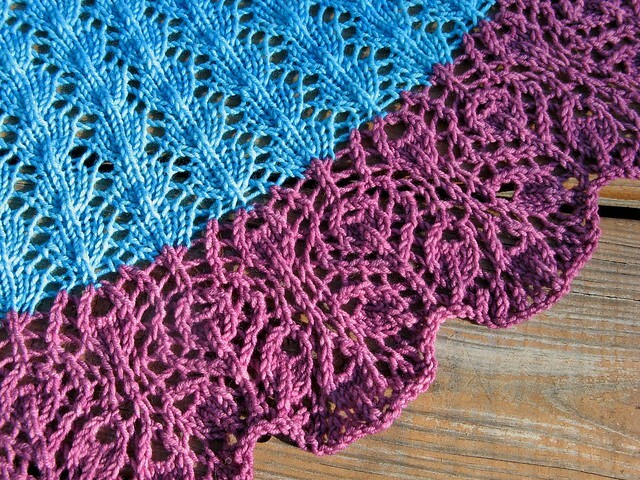 The all-lace border is worked along the entire length of the shawl. Frequent increases in the border allow for dramatic blocking. The complex lace is best shown in a tonal colorway. New Pattern Promotion! Buy Altitude, and receive 25% off anything in my Ravelry store. No limit on number of patterns or ebooks; expires April 30th, 2015. 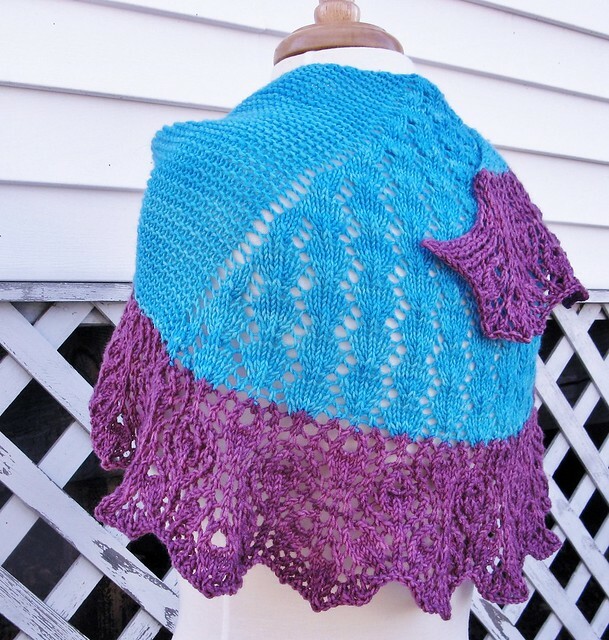 Some things I love about this shawl …. * Color, color, color! 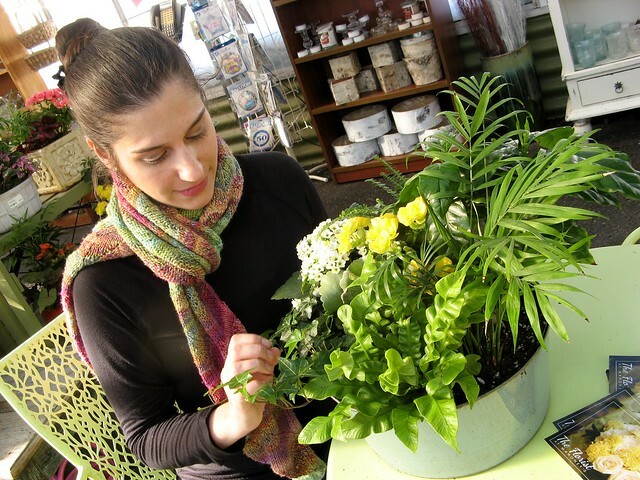 Be as WILD as you want to — the body section will stand up to moderate variegation, so don’t be shy! Or … be subtle and sophisticated with mellow tonals that are closely related. The choice is yours! * Shape! Crescents are my favorite shape for easy wearing. The curve keeps everything in place, and the fabric just swoops across your body with stately aplomb. * Ruffles? Almost! The massive increase in stitch count at the border means that extra fabric for extreme blocking, but it also means the edge goes 3D with very little effort. Lots of movement in the finished piece. Who loves handspun? I do! 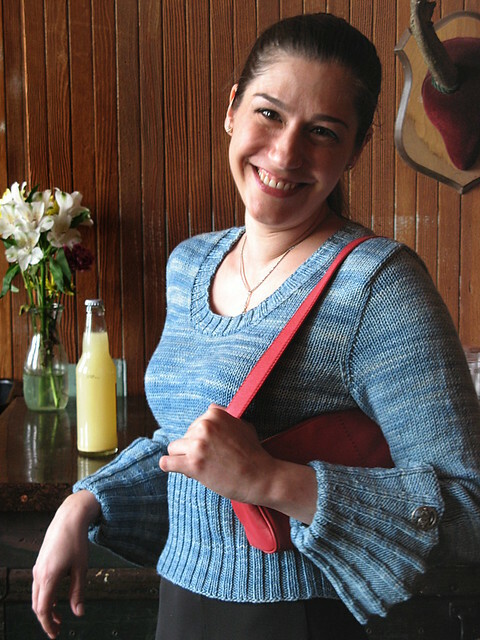 I’m pleased to share this new design via Knitty.com. I give you … Nahant! I read about fractal spinning and had to try it out. 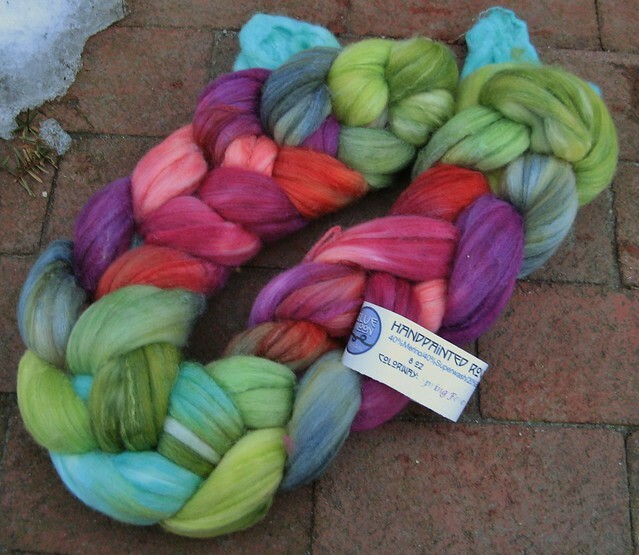 Like magic, colorful high-contrast fiber fluff became self-striping-ish prismatic handspun. I absolutely adored the finished yarn, but it needed to be knit up into something special. Pattern searches left me unsatisfied — the only solution was to design the perfect stole. My requirements: mostly stockinette, with just enough pattern to keep my interest without distracting from the colorful yarn. Nahant highlights the color changes of my fractal handspun with a subtle leaf pattern that doesn’t fight for attention. Knit on the bias, it resists curling. Use any weight yarn (just choose the appropriate needle), and make it as wide or as narrow as you like. Length is flexible too, so you can make the most of that precious handspun yarn. Extra thanks to Donna (who helped me get photos at Nahant Beach for submission to Knitty) and Rebecka (who modeled “springier” pictures for me, as per Knitty’s quite reasonable request).